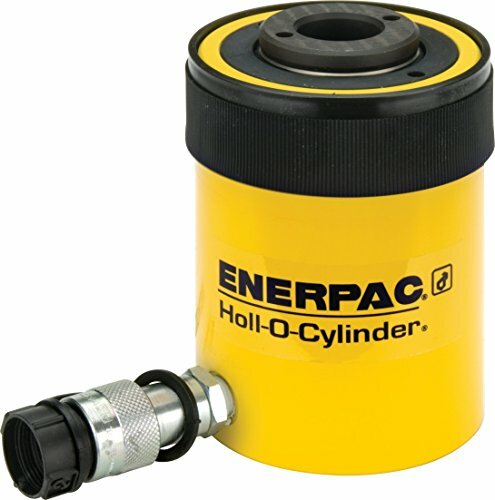 This Enerpac RCH-302 single-acting hollow-plunger hydraulic cylinder with 30-ton capacity and 2.50" stroke has a one port, spring return of the single piston rod, and a hollow plunger for use in applications where the need for push and pull forces might alternate, such as testing, maintenance, and tensioning applications. The single-acting hydraulic cylinder uses liquid pumped through its single port for rod extension and an internal spring for rod retraction to produce continued movement. The port is a quick-connect CR-400 female coupler for use with a CH-604 male coupler (sold separately). Baked enamel body finish provides corrosion resistance. The center tube floats to extend the life of the seals. The threaded collar accepts accessories (sold separately).